NANFA was recently presented the opportunity to support The Nature Conservancy in Kentucky. It wasn't much, no money involved or boots on the ground, but it is a project that our name will be added to showing our support. 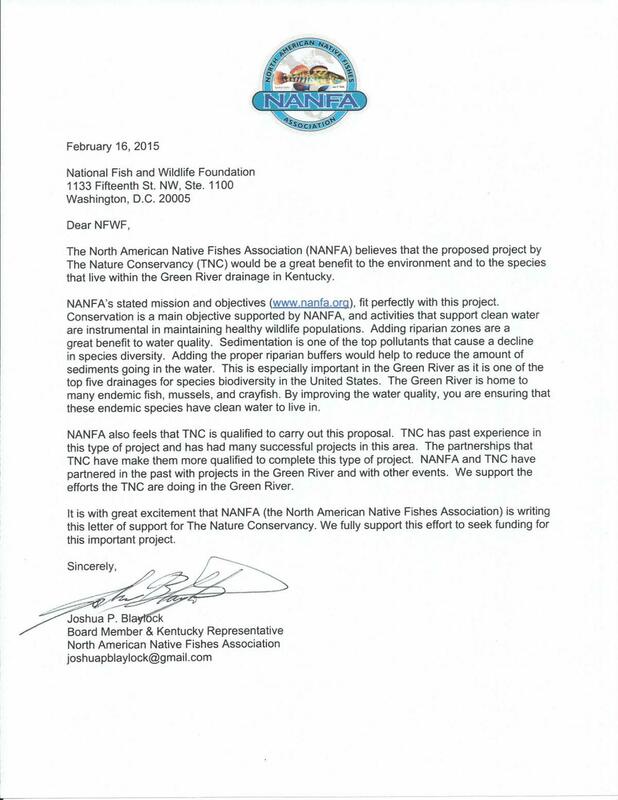 TNC is working on a proposal with NFWF and wanted to see if we would support them and write a letter of recommendation. With the help of Michael and Fritz we drafted, edited, and formatted a support letter. I've attached the project outline, map, and the support letter if anyone is interested in reading it. It truly is a worthwhile project in the Green River and I hope they get the approval. Like you said, a worthwhile project. I hope it goes through. It's neat that they asked for NANFA's support. Good job! Indeed a worthy project. I am excited that they asked for NANFA support, too. You're doing us proud in KY, Josh! You guys hit the nail on the head! We are heading in a direction that I think many of us want. Asking for our support shows that we are no longer being viewed as just a fish club, but a conservation organization. This is great news to me at least. I hope that we can nurture this and cultivate it into something that makes a big difference. I am glad that we can all help out. Very exciting! I for one am proud of us! Me too. I feel that NANFA is moving in a good direction. The more we can associate ourselves with conservation people/organization and F&W personnel, the better.